Whenever a music video (M/V) is released there will always be good and bad reaction on it. This is the same with what happened with Psy, a K-Pop artist’s collaboration with American rapper Snoop Dogg. The video immediately went viral after being released. There might be a factor contributed by the success of Psy’s Gangnam Style and Gentleman that led to this but as what I have said, there will always be negative comments since there are Psy fans who are disappointed because according to them, the music sounded more of like Snoop Dogg than Psy. The video has so many funny scenes, and with the changing of speed, one can say that there is too much time spent in creating the video. 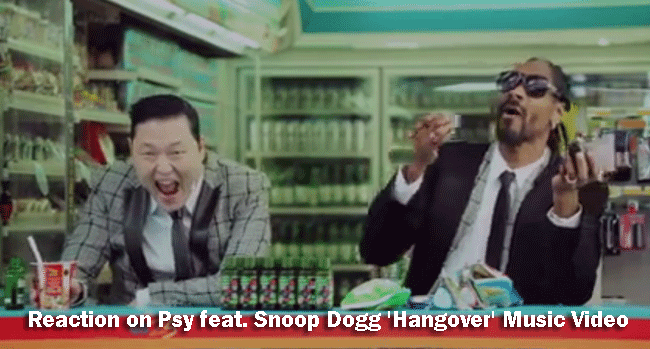 The Psy dancing style is still there with his funny moves and Snoop Dogg’s rapping is preserved. With regards to the plot of the video, I can say that there is a mixture of American and Korean culture. This is evident when you will watch music videos created by Americans and Koreans, you can compare – it’s a concoction of the two. The Psy feat. Snoop Dogg “Hangover” Music Video can easily become viral because it is rare for a Korean to collaborate with an American. And since the genre is somewhat dance, techno, rap and RNB, I do believe that it will become a hit. Well, it is not bad to do experimentation and we will be amazed of what will be result. And since the two artists came from two different continents, there is a chance for a higher sales, listeners and viewers.